On this page we’ve estimated United States Household Income Brackets for 2017. This data is for all households in the United States, tracking income earned between January and December of 2016. We also include a table of every household income percentile for 2017 United States data. (See individual income brackets here). Here we’ve calculated estimated income breakpoints for the 10th, 25th, 50th (median), 75th, 90th, 95th, and 99th percentile of household income percentiles. Income is defined as all income earned: wage income, business income, investment income, and many others. See a list of all components included in the income calculation here. 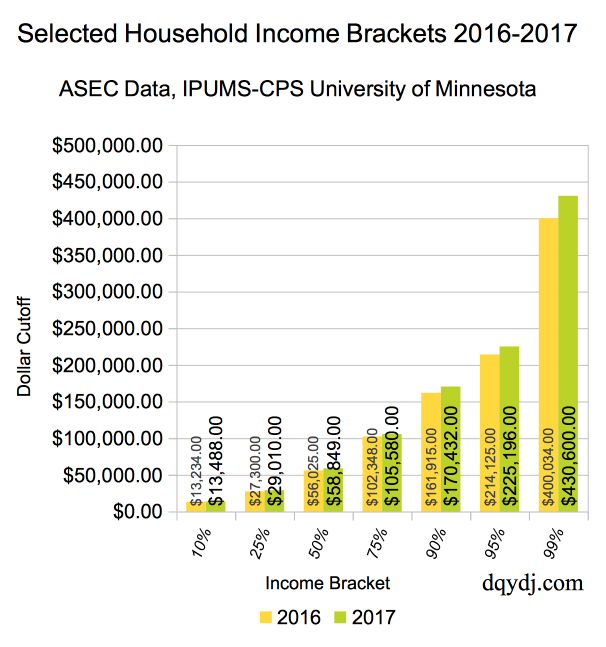 Note once again incomes are from the full year 2016 (and 2015) as data is from the March ASEC. Remember, as we’ve stated in previous articles this data is not longitudinal. It is not appropriate to draw any conclusions from this article about the performance of individual households. 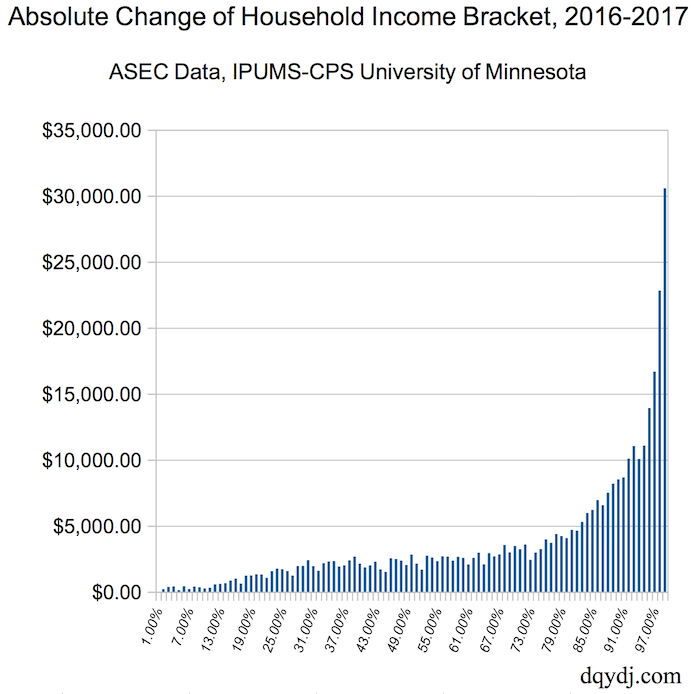 Households will change income brackets from year to year, households will form, and households will dissolve. When you compare income from year to year with this data, only do so with that in mind. Here’s a statement we can make enthusiastically, however – every single household income centile breakpoint except 1% increased year over year. That’s right – every percentile from 2% to 99% had a higher year over year income breakpoint! Compare that with individual incomes, where there were broad breakpoint increases but only for 65 income centiles. In the United States, for investments such as angel investments, private equity funds, venture capital, and other private investments you need to be Accredited. One of the ways to achieve accredation is earnings. Either $300,000 as a household or $200,000 as an individual for the past two years with earnings likely to continue qualifies. It’s more common to qualify in the United States based on net worth, but over 6% of individuals earn more than $200,000 a year and could conceivably be accredited on income alone. See our calculations on the number of accredited investors for more. There are no screens at all for the calculations here, so we are including the entire dataset in our calculations. Median household income was $58,849.00 in 2016, and the threshold for a US household to be in the 1% was $430,600.00. As with the other articles, data originated in the United States Census Bureau’s Annual ASEC survey, first released in September 2017. The University of Minnesota’s Minnesota Population Center harmonizes it and makes it easy for us to create extracts to bring into R.
Sarah Flood, Miriam King, Steven Ruggles, and J. Robert Warren. Integrated Public Use Microdata Series, Current Population Survey: Version 4.0. [dataset]. Minneapolis: University of Minnesota, 2015. http://doi.org/10.18128/D030.V4.0. Unlike with the workforce articles, the data for this article is conventional and uncontroversial. The only filter you’ll need to reproduce our result is to remove duplicate SERIALs, which will leave you with only one datapoint per household. 2016: 69,957 data-points representing an estimated 126,519,332 American households. 2015: 69,484 data-points representing an estimated 126,067,560 American households. In the individual income brackets post, we concluded that it was an excellent year with broad based income gains. We repeat that here, with an enhancement: at a household level, it was an incredible year. Once again, we can’t draw conclusions about individual households from this data. We can however say this about 2016 in aggregate – President Obama’s last full year as president was an economic success. We’ll definitely be checking in on President Trump’s start in the next data drop for 2017, which will be around September, 2018. What do you think of the stats? How did your household do last year? Did you expect every bracket to see an increase? Do you have a chart that breaks these numbers down by age – Household Income Percentiles by Age? Would like to see how I compare on that chart. I have seen a chart with individual income percentiles by age and I’ve seen a chart with household income percentiles, but I haven’t seen a chart that combines the two. Thanks! We do not have an article on this, although the Net Worth data is classified in this way. Do you mean the age of the head of household? https://cps.ipums.org/cps-action/variables/RELATE#codes_section . With that clarification, this is doable. Yes, I meant head of household. I like how you have classified the Net Worth data. I think that is the best way for me to get an idea of how I compare. I was hoping to do the same thing with income. Thanks!